Beading needles are specially designed for beadwork. There is a needle for every beader and each purpose: a loom needle for loom beading; various sizes of beading needles for beadweaving / off-loom stitching; a twisted needle for stringing, bead crochet and kumihimo. 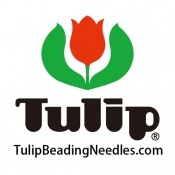 Tulip beading needles are easy to thread, bendable yet strong and warp resistant, with a slightly rounded point to avoid splitting the thread (except the size 10 sharp needle, meant for bead embroidery, having a point that pierces fabric easily). NEW assortment pack contains one each sizes 10, 11 and 12 needles PLUS one size 10 sharp needle.